Can you predict the tracker poll for Friday October 9th? I’m getting to rather like the YouGov tracker simply it provides an opportunity to test my theories about what drives the polls. I’ve always argued here that so much of poll findings outside election campaigns is driven by which party or politician is getting the most attention. For most people are not really that interested in politics. So far the tracker seems to have been backing this up. The Tories have hardly been heard from for weeks, the Lib Dems are still benefiting from their week at the sea-side and it’s Labour that’s been getting the big profile in the past few days. Anyway let’s all think towards next week and try to guess what the tracker will be saying on the day after Cameron’s speech. What do you predict the YouGov tracker will record on the day after David Cameron’s speech next week? Labour close the gap to 7% with the YouGov tracker. But most of fieldwork took place BEFORE the Sun’s news? Peter Kellner has just been in touch with news of today YouGov tracker poll. He emphasises that “most fieldwork reflects impact of yesterday evening TV news coverage but not this mornings papers. Tomorrow’s figures will measure full impact of media coverage, Sun switch etc”. It’s important to note that the numbers we are seeing each are essentially a reaction to the news of the previous evening. So what these number tell us is that Brown’s speech and the coverage of it on TV helped Labour up a point – but provided the biggest boost for the Liberal Democrats who are up to 21%. The Tories are the big loser. Quite why the poll has moved in the way it has I do not know. 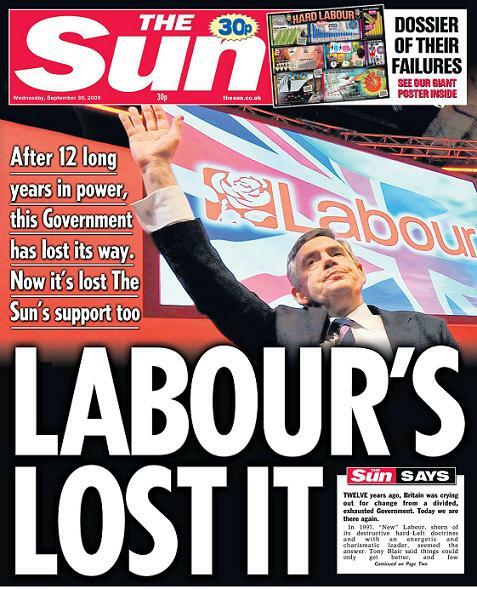 If it had not have been for the Sun overnight then Labour would have been ecstatic. A 7% deficit would have surely meant a hung parliament with Labour and the Tories very close to each other on seats. The numbers tomorrow will start to show whether the bad news for Labour has had an impact. At the very minimum the Sun’s decision became today’s big political story over-shadowing the conference thus depriving Labour of a whole news cycle which it could have expected to be positive. My guess is that Labour will be back into the 20s tomorrow evening. Will any of these be brave enough to call on Brown to go? Do the terms of the market make it a good bet? Thanks to StJohn on the previous thread for spotting this new market from PaddyPower on who, of a named list, will be the first to call on Gordon Brown to step down. The chances are, as far as I can see, that none of them would go public and the likelihood is that Brown will leave of his own accord – probably after a general election defeat. But under the terms of the market all bets are void “…should any of the below not call for his resignation before he leaves the position.” This means that you only lose if another “runner” on the list makes such a call. Clearly Labour is going through a febrile period and tensions could be heightened if, next week, the Tories get a conference bounce in the polls. The more a Labour defeat looks likely the greater the chances of public calls for Brown to step aside. The opening odds on Tony Blair were 100/1 – that’s now moved in to 20/1 – and I wondered whether John Cruddas was the best bet. Of all of them on the list he’s the most independent and most controversial. Purnell might be another possibility but his price is too tight. Measuring the impact of the Sun’s switch? What will today’s news do to YouGov’s daily tracker? So to put this into context I dug out the above from an earlier poll from the firm this month where the firm’s newspaper weighting data appeared. As I’ve pointed out here before YouGov tends to have far fewer Sun/Star readers in its samples compared to the population as a whole and generally they are weighted upwards. Thus in the poll example above 299 of the 2009 people who took are identified as Sun/Star readers but that is increased to 442 after the weighting has been applied. 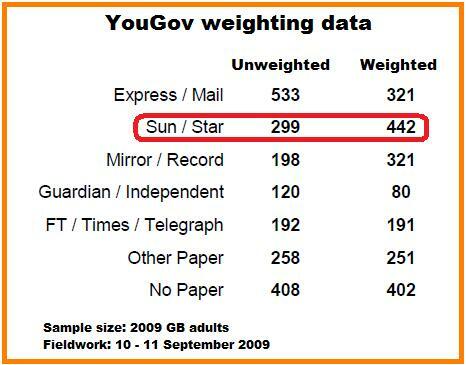 Thus YouGov assumes that 22-23% of the electorate are Sun/Star readers. Given their respective circulations my guess is that just under a fifth of the weighted sample of YouGov polls are Sun readers. Will they be influenced by today’s front page? We’ll have to see. Has this been timed to cause the maximum damage? Will the Sun’s move dispirit the party even more? Labour’s big remaining hope as it entered the conference season was that Brown’s speech would exceed the low expectations and provide the platform for some sort of recovery. Last year the PM’s “no time for a novice” phrase caught the mood of the time and for the final quarter of 2008 Cameron’s Tories were on the back foot. A lot was riding on being able to do the same again – a prospect that looks a lot more challenging following the news that Britain’s biggest selling daily paper is to throw its weight behind the Tories. It had been clear for months that the Sun would decide this way – but it’s the timing, a few hours after Brown’s big speech, that will magnify the damage. For what this does is to change the whole dynamic of the media coverage which in the main had not been too bad. It will, I believe, have an impact in the polls if only to contain the Labour conference surge that we had seen in the tracker surveys. For all the Labour movement hates the Sun almost everybody is painfully aware of its influence and the part it played in undermining Kinnock in 1992 and then John Major in 1997. And how dispiriting for the delegates who’ve travelled to Brighton in the hope that they could return to their constituencies energised with a fresh determination to fight the coming battle. The Sun’s move is a deliberately timed body-blow that will have a big impact. UPDATE 5AM: I’ve just opened my emails to discover that just after I had gone to bed the Sun sent me a copy of the front page featured above. This is the first time that any newspaper has ever done that which has allowed me to reproduce a much more detailed picture on the site. Within four weeks of this conference speech Iain Duncan Smith faced a confidence motion which he lost. Michael Howard became Conservative leader. Meanwhile we now have the YouGov post speech poll – the first figure is after the speech – the second is before it. So the following is just about meaningless as a test of representative opinion. 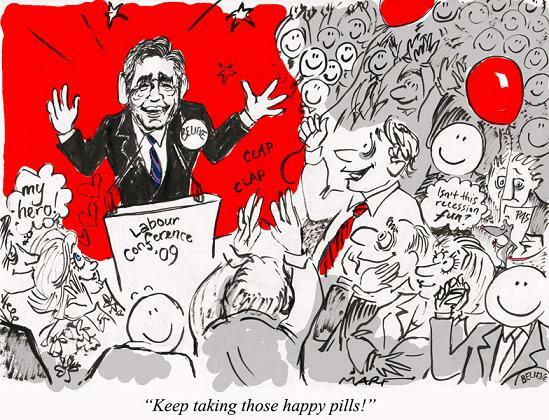 Do you think Gordon Brown is doing well or badly as prime minister? 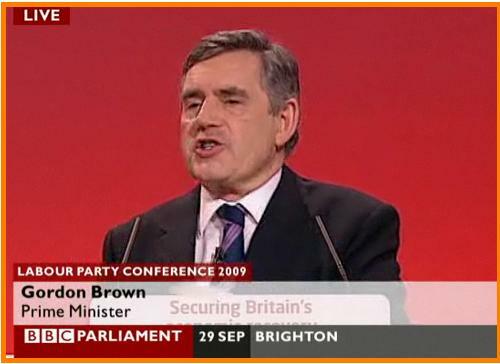 Broadly speaking do you think Gordon Brown isâ€¦? How would you rate Gordon Brownâ€™s speech this afternoon? These are not numbers to use to try to forecast the general election. We’ve seen it in the post-debate poll in the US elections – first reactions rarely tell us anything. It will be the same next week with Cameron speech. Wait for the mid-October voting intention number – everything else is fluff.